At Glen Ivy Hot Springs, we’ve designed the Bath House to be your base for the day. Our Women’s and Men’s Locker Rooms provide you with lockers for your belongings as well as bathroom and shower facilities plus all of the amenities you need to leave your wellness day looking fabulous. Here you’ll find shampoo, conditioner, blow dryers, curling wands, styling products, body lotions and more. If you don’t see something you need, just ask! 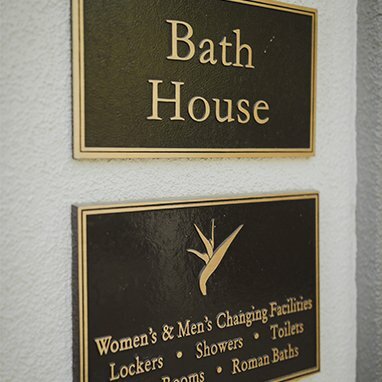 When you arrive at Glen Ivy we recommend heading to the Bath House first to get your locker. If you haven’t put a card on file and would like to, our Bath House Attendants can do that for you here. The lobby has a limited selection of items for purchase including robes, hats, sunscreen and cover ups. If you’d like to rent a robe for the day, or have a robe included in a treatment package, you’ll pick that up here as well. An integral part of the Glen Ivy experience, the Bath House is also home to the Roman Baths and our steam rooms. Relax and enjoy these amenities indoor for a break from the Southern California sun.